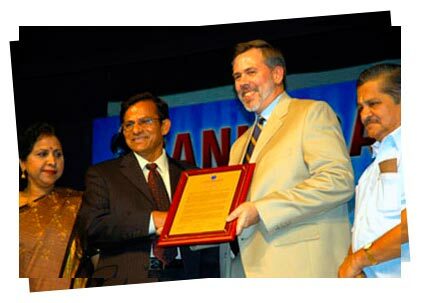 Shri S.V Acharya was conferred with the Sankara Ratna award in 2005, for his outstanding and dedicated work in support of Sankara Nethralaya, through the Sankara Nethralaya Ophthalmic Mission Trust Inc, USA. The Sankara Ratna Award was instituted in 2002, the Silver Jubilee year of Sankara Nethralaya. This award recognizes and honors a distinguished individual or an institution supporting and contributing to Nethralaya’s cause and philosophy. Shri. Acharya had served with distinctions in various senior positions in the US Federal Government he was in charge of Budgetary Operations at the Public Defender Service for the District of Columbia. He joined Government Service almost a decade ago, initially serving as Fiscal Administrator for the state of Maryland, and then as Director of Accounting operations for Peace Corps World headquarters DC for five years before moving to his current position. Shri. Acharya served as Editorial Advisor to the prestigious American Institute of Certified Public Accountants publication “Journal of Accountancy” for six years and was awarded the “Distinguished Service Award”. He was also awarded “Meritorious Service Award” by the State of Maryland in recognition of his superior performance as Fiscal Administrator. He retired recently and devotes his time to the family and social work. Shri. Acharya is the founder of the Sankara Nethralaya Ophthalmic Mission Trust founded in 1988, an organization whose mission is to spread the philosophy, objective and awareness on the work being done by Sankara Nethralaya, in the USA. He has spearheaded his passionate mission with amazing zeal, set a great personal example and continues to lead from the front by constantly exploring ways and means to reach out to the Indian community in the USA; he has set a great personal example and has also identified likeminded people to join the Trust. He has been instrumental in creating a high level of awareness on Sankara Nethralaya and empathy for its cause amongst the Indian Diaspora in the United States, which is a result of his spirited interactions among this section, organizing meetings, cultural and entertainment events to create awareness and raise funds. Shri Acharya’s shining example has motivated hundreds in the US to support our cause and the SN OM Trust continues to scale glorious heights in service under his able stewardship.